So what would it take to swap one into an sn95? 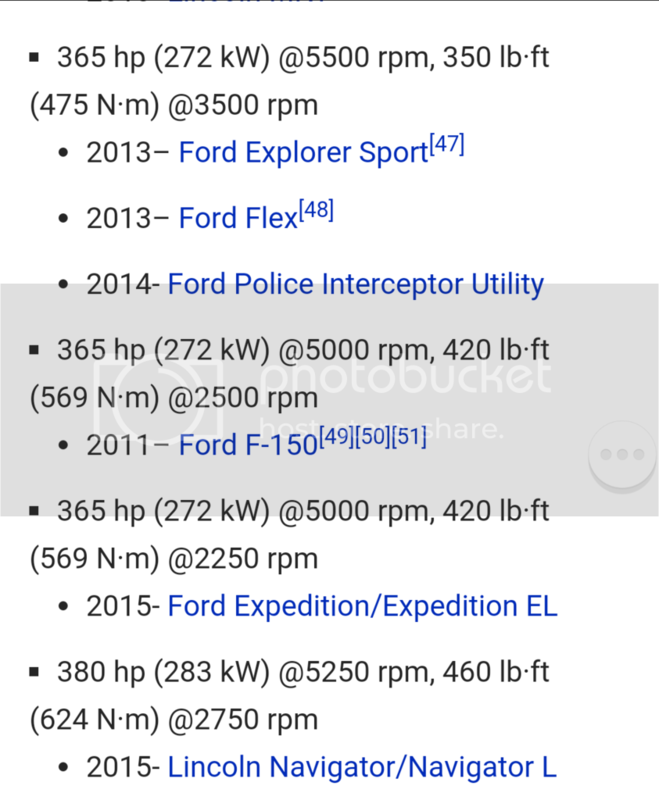 are all the ecoboost v6s from F150s? does anyone make a control pack? Do they need an electric gas pedal? I'd sure like to have three or four hundred rwhp, cleaner emissions, and 30mpg. Look up AJ Hartman's American iron build. He just started a swap on his new edge. Powerhouse Automotive out of PA (you might know his coyote stock maverick) is going to be putting one in a Fox SVO. Here is a 3.5 Ecoboost controls pack. Yeah from what I've read the factory ecu does not like being swapped to another car. That is retail price as you cannot buy from Ford Performance directly. Here is an actual dealer what they sell it for. We're in the process of designing k-members for both a Fox and SN95 Mustang swap. The basic design has been done for a long time, but FRPP only recently released the controls pack for the engine, so now we can really move forward. AJ is using the 3.7l version of the MT82 because it bolts right on, is cheap and will handle the power of a detuned engine. He has to detune the engine to be within the power to weight and torque to weight rules of AI. For virtually anyone else doing the swap, they should use a TKO500/600 or a T56. The MT82 is not going to last long with the engine making 500lbs-ft of torque. You could just poo on the ford racing controls pack and go with the 6R80 that comes behind the f150 motor. The pats system can be disabled in the stock pcm's now, opening up the door to easier swaps. Performance Automatic offers a stand alone controller for the 6R80 trans that will work in conjunction with the Ford Performance controls pack. Location: Caledon, Ontario Canada !! Is a 6R80 going to fit in a Fox or SN95 tunnel? I've not seen one beside an AOD or 4R70 to compare. One way or another, at least one is going into a fox! my brother has a Taurus SHO with the same thing and my Explorer Sport has it too. We have a Capri with a 6R80 and a coyote in it. There were no floor modifications done to it. What did you use for wiring up the motor/trans/pcm? Any write up or pics? No write ups yet. This car is a test bed for the Ford Performance Coyote power module with the 6R80 trans. It will be a kit that will be available around August of this year. The engineers are working on the calibration of the auto transmission now. Yeah, I just chatted with ferd racing and left extremely mad. They are working on the control pack for automatic applications but they will ONLY work with 2015+ motors and transmissions, won't work with earlier applications due to differences in hardware and electronics and they have no plans to support earlier applications! I let them know how STUPID I thought that was and disconnected from the chat. Wish I could talk to the guy making those decisions, I'd give him an earful. Unfortunately the 2011-2014 engine is no longer available to buy from Ford. That is why they are doing the kit for 15 and newer. I am the supervisor of the Ford Performance tech you were chatting with. Look up a company called power by the hour in Florida. They have a kit for the 11-14 engine with automatic trans. Performance automatic also has a controller to run the trans independently. I still don't understand why ford racing can't or won't do a controller kit for the earlier application since there are thousands upon thousands of 11-14 coyotes, truck and Mustangs, in salvage yards just waiting to be transplanted into other cars and all could use a harness kit. I don't understand why ford racing would turn their back on so many possible customers. That's not good business. As to PBH, if they have a kit, it isn't shown on their website, if you have inside info please share it. As to PA's controller, too pricey, plus I really don't want to have to have two pcm's to control the combo. I think that people don't understand the position that FR is in. A large number of their products and technology rely on hand me down from production applications. Once these products are no longer being used in current models, FR's leverage to get these made drops massively. Their ability to piggyback onto an existing platform's engineering team also goes away when that engineering team gets disbanded. I think you are also way overestimating the sales potential. There are tens of thousands of LSx engines sitting in junkyards, but the number of Mustangs with LSx swaps is still a tiny, tiny amount compared to the number of modified Mustangs. The same is true of Coyote swaps. Adding an automatic transmission behind that drops the numbers by another factor of ten. Given limited resources, it makes sense for FR to concentrate on parts that could be used on any of the 200,000 Mustangs sold each year, by the average person. But, the control pack and the engine/trans packages will NOT be used on any of those 200,000 Mustangs sold each year. They are strictly for the guy hot rodding an older car, they are not emissions compliant or certified. Oh well, it's alright, I'll make my combo work, no thanks to ford. Call Power By The Hour directly and talk to Frank. He can tell all about the kit they have. I felt I had to chime in. I'm pretty deep into swapping one into my 99 Mustang that I race in American Iron. I had to modify the tunnel to get the MT82 to work. I agree with Jack that most people would not use this transmission. Since I have to detune the engine to be legal, I think I can get away with it. Other wise a TKO would be a better choice, AND you probably would not have to modify the trans tunnel. The control pack from Ford Performance should get everything running. Luckily the complete engine drop out I got from a salvage yard came with the engine side harness as I learned that the control pack doesn't come with the engine harness. Maximum Motorsports were awesome enough to work with me and I was able to get one of their K members without engine mounts, but I know they are workin on one. I'm sure they will have a much better solution that I came up with. Custom drive shaft, some other odds and ends and your done! Ok, theres more to it than that, but all the parts I believe are out there, and if you have some fabrication abilities, it can be done. Heres the link to my build with more info. what's the power potential of these motors in stock trim and how high can you spin them? The power limit is the size of the tiny turbos. The ECU has software to keep them from being over revved. To make much more power, the engine needs larger turbos. In a Mustang this is going to be very, very difficult to package given the location of the frame rails on each side. The turbo max rpm also limits the max engine rpm. It's short, but this version was designed for a truck, which has a wide engine bay. The turbos are mounted directly to the exhaust manifolds on the side of the engine. This makes the engine wider in the rear, right where the Mustang frame rails are closest together. The SHO version is for transverse mounting so it has a different block, different turbos, etc. i'm guessing that most would be fabricating their own turbo headers so would that help? Nope. The stock exhaust manifolds are tiny and super close to the heads. The turbo bolts right onto back of them. An aftermarket manifold won't make the engine any narrower. It would save some weight, but will hurt engine efficiency since it will leak heat out before the turbo. I guess the explorer sport version is the same, isnt it? If they're similar output, probably close. F150 coyote is different intake cam from the Mustang and not much else. But the main difference Hidley pointed out between f150 and taurus evoboost is transverse vs longitudinal. Ford had different packaging concerns. There's clear torque differences, not sure if pistons or other major stuff is different. Where's our Ford techs and junkyard regulars? A guy who writes for road and track has been working on his own for a while now. His is a Focus ST ecoboost so its a little different, but a lot of Mazda parts bolt up. I'm not sure if the new turbo 4 shares that architecture. But MM is playing with a 4 cylinder ecoboost K member that's mocked up in his fox. OK, so let's say I stumble across a 2015 V6 ecoboost at the junkyard. I'd get the control pack from LRS or Ford, and I think Sean Hyland has motor mounts that will shoehorn the motor onto my MM K-member (5.0 in a 95). What bellhousing will interface the block to my stock T5?